Eric and I have put together a five-part podcast series designed to help you take your life to the next level–so you feel EXCITED when you wake up each day. Ever feel like it’s easy to drift? Or to get started with something, but never finish? We’re sharing three simple, unique ways to anchor yourself in your values, so you have focus and direction when you ask, “What do I want to say with my life? This exercise helps you see the connection between the people you admire and the person you want to become. On a sheet of paper or a digital note, write the names of people you love and admire on the left. This could include God, friends, relatives, fictional characters, historical figures, famous or not-famous people, and more! Then list out the characteristics you admire for each of those people on the right. Those are your values. Seeing a clear list like this is a great start to anchoring. Based on the idea inside Jim Collins’ Good to Great, finding your hedgehog means you identify the intersection between what you are passionate about, what you do really well, and what can drive your financial engine. There are a LOT of things you can “do” with your life. But we’re not looking to keep ourselves busy. We’re looking to make an impact. Every season, I create a new note in Evernote that features a list of reminders to keep me on my course. I don’t know why it happens—but doubt has a tendency to creep in, and when you write down who you are, who you are fighting for, what you are doing, why you are doing it—and any words of encouragement you need to offer to yourself on a hard day, that is going to lift you. You know what you need to say to yourself, and it is so helpful to have this note ready and waiting for you every day for a quick lift. We believe we can identify our values. We can find our Hedgehog. And we can set up a daily routine where we remind ourselves of the incredible opportunity we have to live, serve, and create a life where each day we wake up excited and go to bed content. We are really, really excited about the things that are coming. I (April) particularly feel like I am just now stepping into my “Hedgehog” and my true purpose. And while it is so, so scary sometimes, walking TOWARD the fear and doing what we’re meant to do feels so much better than the alternative. Shrinking is easy. Staying in bed watching Netflix is easy. Standing up and standing for something and taking on a leadership role because it’s what you know you’re meant to do? Not easy—but totally worth it. Did you ever see The Neverending Story? And that part where the little boy reading the book wondered if it was really talking to him? Well, we’re really talking to you…. CHALLENGE: Commit to Anchoring. Commit to a life that isn’t drifting. And start the process—however it works best for you to do so. Then come share! If this podcast was helpful for you and you’d like to share, you can click here to share it with your friends and family on Facebook! Want to read more about the Hedgehog Concept? Check out Jim Collins’ book, *Good to Great! 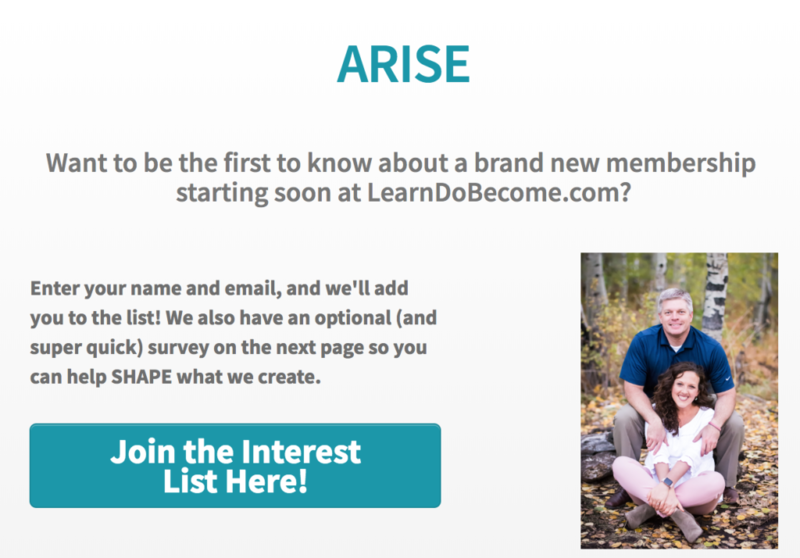 If you haven’t filled out this ARISE survey, our new monthly membership is starting this year, and we want YOU to help us shape it! Click here to share your ideas and join our interest list, so you can hear more about this exciting new membership as it comes together! 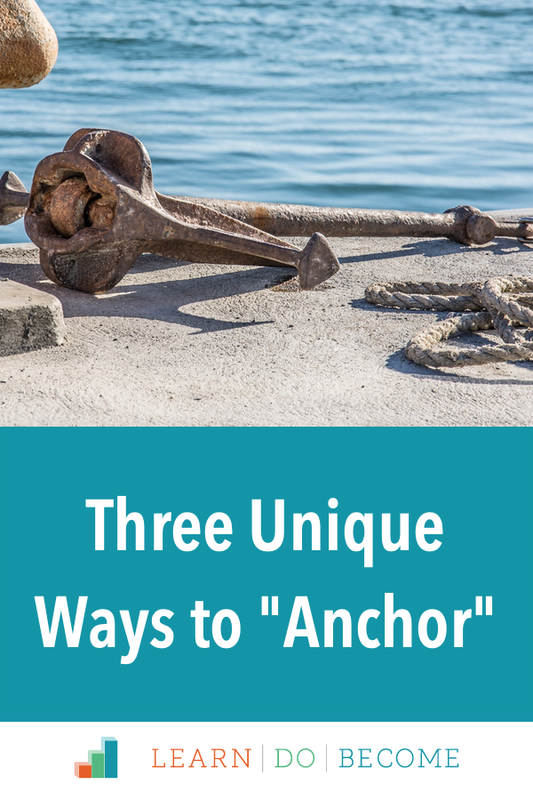 If you have piles all around you and thousands of emails in your inbox, you might not even be able to wrap your head around the idea of anchoring. That’s why getting organized comes first for me. Clear the piles, get out of the email clutter. Get your house clean and your life clean and then sit down in that beautiful space and think. 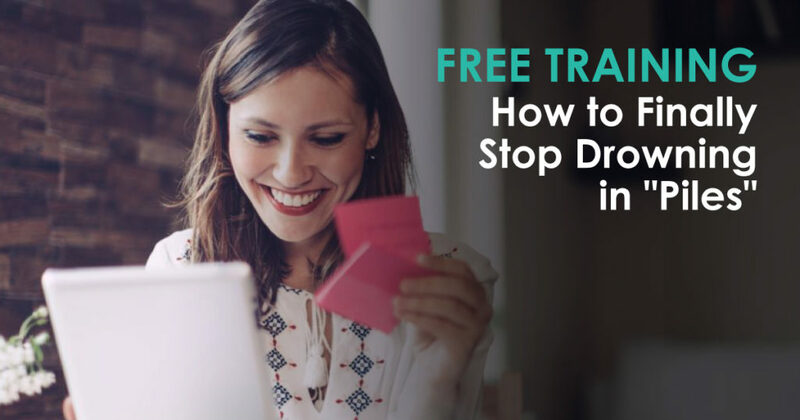 If you’re interested in learning four steps you can apply today to help you create space–both in your mind and around you–we’d love you have you join us in our free training, How to Stop Drowning in Piles! ***This page includes affiliate links (to books, in this case). Please read our disclosure for more info. So happy to hear this, Robyn! It’s seriously the NORM to jump from one thing to another. You are moving in an awesome directions. Excited for you!!! I’m still working on the STEP program. Trying to figure out projects and what kind of scope to start from. Does that come from knowing my “hedgehog”? So happy you are doing STEP, Patricia! I encourage you to build the whole Command Central and get the details taken care of, and THEN when your mind feels calm, start the process of exploring what you really want out of life. More will be coming soon on those kinds of topics! Serving in the temple helps me anchor and remember that I am engaged in a higher cause than my day to day challenges. I still have a 16-year old at home, so my temple service is in the laundry. I used to think of that as insignificant, but if you have seen the chaos that happens when there’s no one in the laundry to do the many small jobs there, you begin to realize that you are an anchor for others and help provide the foundation on which they can serve. It is much like mothering. As mothers, we provide a place for our family members to launch and do many great things. Our service, providing healthy meals, clean laundry, a listening ear, or a safe place to land, allows them to feel safe to launch into their own achievements and causes, fulfilling their purposes. And, even as I have spent many years (36, so far) being “the mom” and providing that foundation, I find that my opportunities to serve and grow have not been diminished. At 59, I am becoming a better mentor, and better presenter, and a better friend. I am able to contribute in new ways because of the capacities developed in me while mothering. Don’t let “FOMO” keep you from going all in on motherhood. It is helping you grow in more ways than you imagine! Amy, you have a wealth of knowledge! And I totally agree–there’s often a FOMO when you are a caregiver, thinking that the excitement is happening elsewhere. The more experience I get, the more I realize that the relationships with our family and loved ones mean more than anything. Sending you much love! I’m not sure what anchors me. I feel like maybe I’m not a ship but maybe a raft that never leaves shallow water. I have so many interests, and so many things I’m good at. However, just because I’m good at them, doesn’t mean I need to be the one doing it. I feel like I can see down several paths and they make sense, I can get motivated to do them but I don’t feel drawn to one over another but don’t know how to make them work together. Make sense? What really anchors me is God’s word and Jesus Christ. Knowing Him, then obeying Him in the details of thanking Him for the opportunity of a relationship with Him, and with other people, spreds joy in doing things: for example say in cleaning the house for my family. I am actually doing that task for the God who gave me that opportunity and He gives the joy! Thank you for sharing that, Mary!! This has been so important to us, as well. And I love that you are equating family contributions with love for God. Beautiful!! Another great podcast! These podcasts are one thing that helps anchor me. When I need help getting motivated or inspired to tackle the tasks in front of me the messages I hear on Learn Do Become always get my brain going in the right direction. Both of you are on my personal Hall of Fame. I appreciate April for her authenticity, kindness, perspective and organizational skills. I appreciate Eric’s humor, vision for the future, and the support he gives his wife and family. Just wanted to say thanks and keep up the great work! Thank you, Kara!! We are HONORED to be in your personal Hall of Fame. Your kind words mean so much, and we are here for you! Also looking forward to learning more from you as we all move forward! Thanks so much for sharing this. I felt like I lost my anchor when my parents died one right after the other. I was beginning to find a new normal when my brother suddenly died unexpectedly. I was immediately overwhelmed by caring for my sister-in-law who had early onset alzheimer’s. My sister-in-law passed away a few years ago, and I have found a new normal, but this message has really spoken to me about how to re-focus my life. For that I am truly grateful. Kathleen, you’ve had a LOT of huge responsibilities and loss come into your life, and I am so happy you are here with us. I have no doubt that as you take time to refocus and move forward on what feels exciting to you, you’ll make a difference in the lives of many, many people. Thank you so much for sharing! Hello Eric and April! Thank you for this podcast, it is very informative. I like what Eric said about the hedgehog rolling up into a ball, protecting itself. Reminds me of the times, past and present, that I didn’t take the step of faith towards that opportunity (whatever ‘that’ was). I am ready to unroll and move towards the leadership role I envision God has for me; and also SO ready to ‘wake up excited and go to bed content’. My anchor varies, yet always comes back to God. I meditate, pray, journal, read or hear something that brings me back to His truth. This always helps me to re-center and I can continue forward with more perspective, courage and certainty. I also enjoy your phrase, “There are a LOT of things you can “do” with your life. But we’re not looking to keep ourselves busy. We’re looking to make an impact.” This resonates with me as I also want to make an impact in the lives of people. Beautiful insights, Julie! We are so excited for you as you take these great steps forward! Thank you for this podcast! You’ve challenged me to write up a daily reminders list and to not just write up “To do” stuff on it. What anchors me is my relationship with God through Christ Jesus. Reading the Bible and praying daily keep me focused on what He wants from me and on how He has worked in my life. I am in Bible Study Fellowship, which is a world-wide group which is very helpful. I guess it is another anchor in my life. We have daily Bible study assignments and meet weekly to discuss our study and go deeper into the Scriptures that we have studied. The study challenges me on a daily basis to apply the Bible to my life. It is challenging to hear how other group members are applying the Bible to their lives. I highly recommend it. Such a beautiful thing to share! Thank you so much! We love seeing how our community members apply these ideas. Keep up the great work! I love your Podcasts April and Eric! I am a very task oriented person and so being able to LISTEN to inspiring, motivating messages while I work keeps me going. I am excited to Define my anchor so that I can focus on the direction God needs me to go. I have been a member of LearnDoBecome for over 3 years now and it has helped me tremendously!!!! But I do keep hitting some spots where I am thrown off course and find myself drifting again. Routines is a definite help but I also need to implement more of the STEPS with the command central and weekly reviews. Thanks again for finding your Hedgehog which is to help us find ours!!! So kind of you, Lannette! Sounds like you are moving in a great direction, and we are so happy to have you here with us! !